Gravois Creek is a tributary of the River des Peres (Deh Pear) in South St. Louis County, here in eastern Missouri. It is filled with water that is collected by many little gulleys and waterways that span from Interstate 55 and Lindbergh Boulevard to north of Interstate 44 up into Kirkwood. It ultimately dumps into the River des Peres in Lemay, about a mile before the Mississippi River. It winds its way through mostly residential areas, with sparse forest and wetlands surrounding it here and there on its journey. It also spends some of its length passing through industrial parks and commercial zones, with all the exposure and pollution that major roadways and manufacturers tend to create. 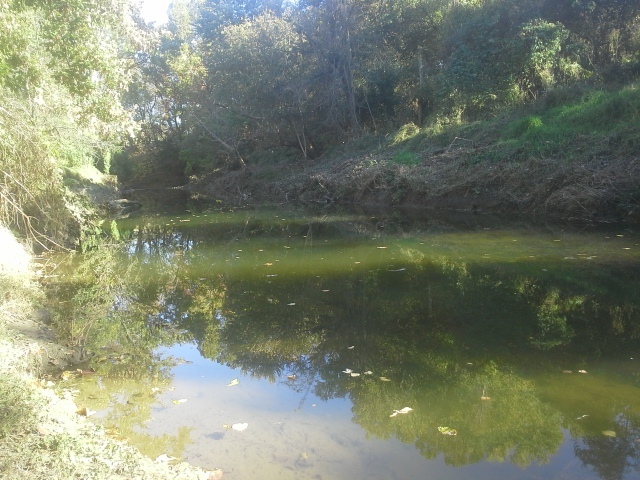 It is not a healthy creek that you would catch fish in, or could imagine spending your childhood days splashing in. 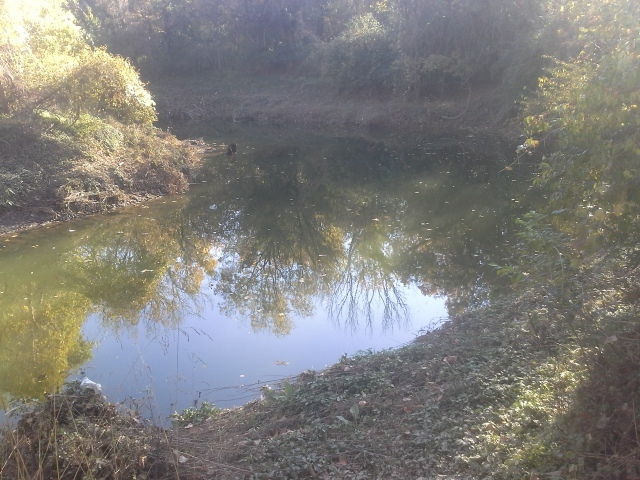 It is polluted and gross, and though there is aquatic life in it, it is not very healthy. 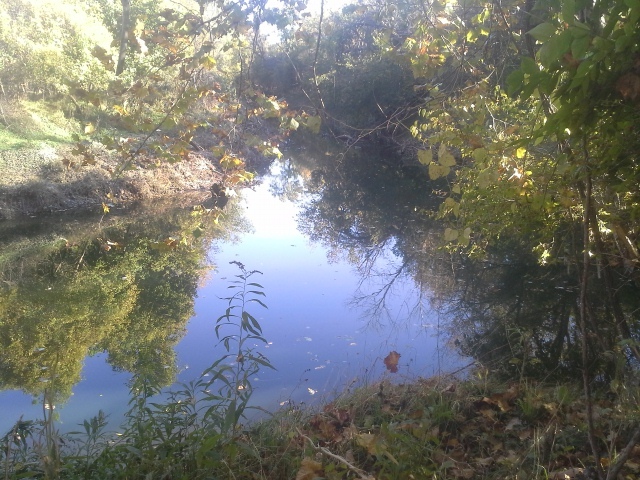 It is about 9:30 am, on a 55 degree Saturday morning in mid-October, and I am up to my shoulders in Gravois Creek. I have a rope wrapped around a gloved hand, with a paddle in my other hand, pulling a recently submerged canoe, half filled with dumped tires. Welcome to the River des Peres Trash Bash! It all started out so harmless. Today was the day for the River des Peres Trash Bash. An annual event put on by the River des Peres Watershed Coalition, an organization whose mission is “to improve, protect, and maintain the River des Peres, its tributaries, and its watershed as a vital natural and cultural resource in the St. Louis metropolitan area”. 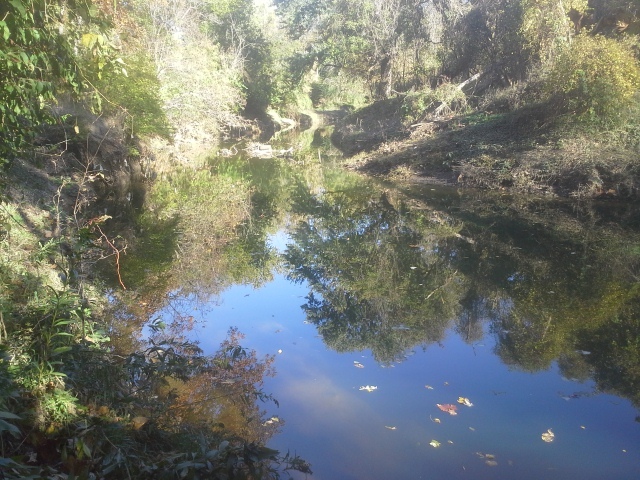 A group of people who have an interest in making this big drainage ditch in the St. Louis area just a little more likable with some tender loving care that it so desperately needs. They are fighting a struggle that is faced by every waterway in Missouri, but this one in particular has the bigger challenge of being in a concentrated metropolitan area. The struggle to keep it healthy is practically a losing battle. So partnering with Missouri Stream Teams, the RdPWC organizes cleanups periodically, and gathers volunteers to hit the woods around specific areas in St. Louis County to pick up trash and debris and dumped tires and appliances that happen to be littering the waterways that wind out of and through so many neighborhoods, and ultimately out to the Mississippi. This was one of those cleanups, and as a person who only just this year started volunteering at Stream Team events, I am just one in the large group at Fultz Field who is waiting to head out to our designated site and get to work pulling all the crap out of the forest that people with a lazy sense of judgement decided to put there. We all sign in, sign a liability waiver, get our supplies (free gloves and trash bags), hear the “be safe and work together” speeches, and then head to our cleanup sites. 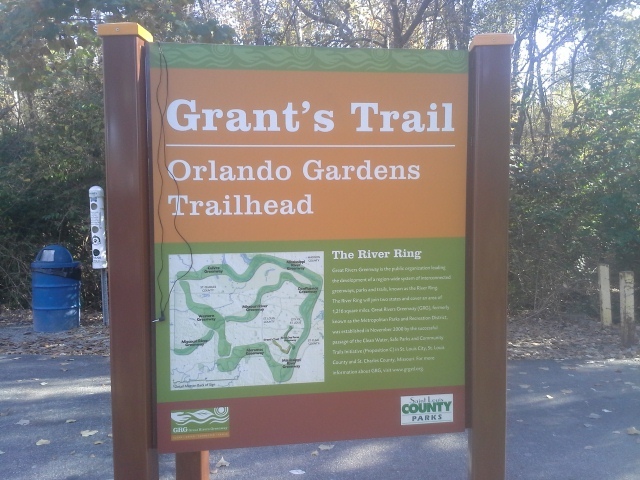 On this particular cleanup we are going to be working along Grant’s Trail, a paved biking and walking trail that extends through South St. Louis County, at the trailhead for it that is along Interstate 55 near Orlando Gardens, off of Union Rd. This is a frequently used trail for bikers and joggers and walkers, and it takes people through hidden natural areas that you would never have known were there. Little sections of forest with a creek and birds and wildlife habitat, among the many subdivisions that fill our corner of the county. We are here to improve the health of this particular little section of forest today. We all park, and start heading down the trail, eventually turning into the forest to start looking for trash. The trip leaders and organizers had scouted out this area the day before to determine the spots where we could make the most impact, and they discovered that the section of Gravois Creek that flows through here is filled with dumped tires. Bordering a BMX area that is adjacent to the trail just behind local bed and breakfast “The Lodge”, is a bend in Gravois Creek in which lies the abandoned footwear of cars gone past. Unfortunate headaches for drivers, that ultimately ended with some jerk depositing what seems like a truckload of them into the nearby creek…instead of properly disposing of them. This is not where old tires are supposed to go, and one of our missions today is to collect as many as possible and take them to the local tire shredders. So people start to make their way slowly through the surrounding forest, with their gloved hands and mesh bags, picking up plastic bottles, aluminum cans, grocery store sacks, and whatever else they come across on the leaf litter that doesn’t belong there. This is the typical Stream Team cleanup experience; walking through a natural area near a waterway, and making it prettier by gathering all the litter and properly disposing of it. My mission today however was more specific. I was going after the tires. Walking next to a canoe in the slow moving creek, I was making my way through the water, looking for that unmistakable round silhouette. Reaching down to pull out a tire, then taking a few steps to discover another one. It is a process of popping it loose from the mud, scraping the lodged dirt out from inside it, and then dumping as much water out before setting the tire in the canoe to be taken, after it is filled, downstream to where a group of volunteers was waiting to help load them into a trailer. I had pulled out about 14 tires from a 50 foot stretch of Gravois Creek, decided that was enough for a load, hopped in the canoe and started paddling my way to the people on the bank that were going to do the hard part. It wasn’t 30 seconds on my way that I heard the sound of rushing water. Had I thought about it, I should have stayed out of the canoe, guiding it to our landing point…but I thought that it might be nice to ride my way there, take a minute to sit and be out of the filthy water, and pull in triumphantly with my bounty of rubber and tread. Yeah, one side of the canoe had dipped below the surface due to all the weight in it, and my boat was taking on water. At that point there is nothing you can do to stop it. It will continue to fill, and I felt that if I could pull it submerged with the air trapped in the upright tires to keep them afloat within its gunwales, I could probably get them all to where I was heading with just a bit more effort than I was planning. And that’s when I hit the deep part. 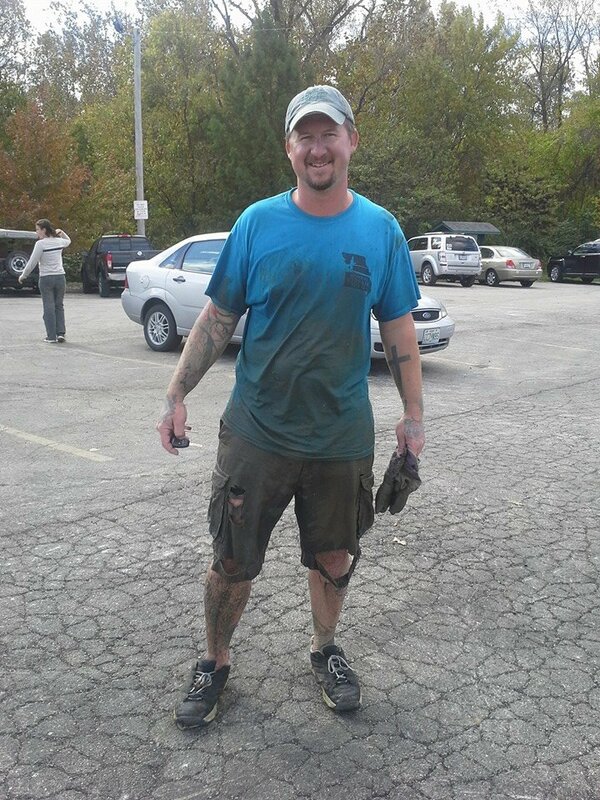 So there I was, paddle in one hand, rope in the other, swimming through the mucky water of Gravois Creek while pulling a submerged canoe with a trail of floating tires behind me. I had bitten off more tires than I could chew, and learned an embarrassing yet valuable lesson about capacity and enthusiasm that I wasn’t going to forget. Luckily I had a more seasoned veteran than myself by the name of Jay in another canoe following behind me, grabbing all the tires that had escaped. I made it to shore, unloaded the four tires I had left, and then pulled the canoe out and dumped the water, so that I could head right back in to go collect more. This was my Saturday morning float trip on Gravois Creek in South St. Louis County, and disgusting as it was, it was one of the most satisfying adventures I have had that involved a canoe. All in all, I estimate that Jay and I pulled probably 40 tires out of about a tenth of a mile of Gravois Creek. And there are still so many tires left. Now this isn’t typical of what is expected from a Stream Team volunteer. The usual cleanup is what I described above: a group of people walking through the woods picking up litter, thereby beautifying a natural area and improving its overall health. Getting in a canoe in a polluted, mucky creek to dig tires out of the filth is the kind of a role that the crazy-enough-to-do-it volunteers take on. I enjoy being included in both groups. There is a strange switch in my head that clicks on (as I’m sure it does for a lot of volunteers and team leaders that I have come to know) that allows for this to happen. Typically I would see these filthy, disgusting waterways as something I wouldn’t think twice about NOT getting in…but you put that canoe in the water and tell me that there are tires to go find, I can’t wait to get splashing. It is a perverse and irresponsible satisfaction, that exposes one to bacteria and chemicals that we should all stay away from. The hook that gets you is when you see that pile of tires you removed heading down the road in a trailer on their way to their proper resting place, and not in the creek anymore. It makes you really see and feel the impact you can have on the health of a natural place. I really enjoy being a Missouri Stream Team volunteer. There is a lot that a determined group of people can accomplish together. Walking into a forested flood plain along the Meramec River to spend a couple hours picking up litter, I love taking a moment to look back and see where we have just come through. Nothing in it but leaves and wood and things that belong there. It is a pretty awesome feeling. You should be a part of this too. Go to the Missouri Stream Team website, and get involved. They can get you in touch with established teams nearby, give you information on starting your own team if you want to, and have a calendar of events so that you know when and where to go to volunteer for a cleanup or water quality monitoring event. If you like spending time in nature (and I’m pretty sure you do), be a part of this. Make a difference. Give a few hours on a Saturday morning with other great people, and improve the health of a natural place. Look back and see a litter free forest floor. It is not only good for that area; you will find that it is good for you as well. And I promise, they won’t make you swim in the mucky water…unless you really want to. Sounds like you had quite the experience! Great job for volunteering. Keep up the great work! It really is an addiction. An organization where the volunteering doesn’t feel like you’re just doing it because you feel like you should. Thank you for helping out with the clean up on nov 9 th at 1 pm. 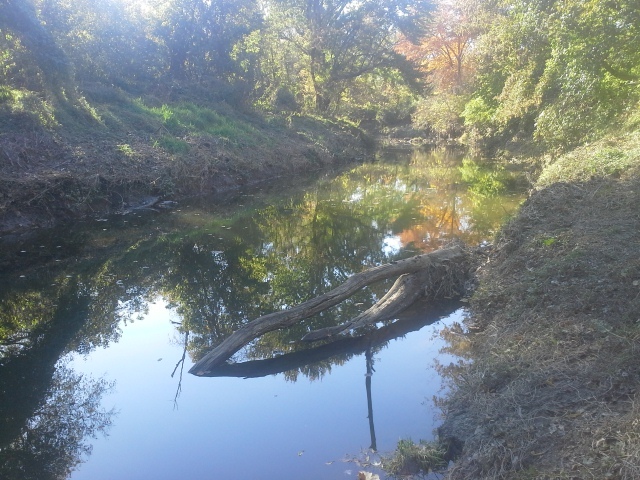 we will bedoing a chemical monitoring on Maline Creek come out and see whats is in our creek and how poluted it is. David, in some of these urban creeks…I don’t know if I really want to know how polluted they actually are. Ignorance is bliss if you’re swimming through it, sometimes. Thank you for the invite. Monitoring the quality of the water is an integral part of the process.